Titan, Saturn's largest moon, and second largest moon in solar system, after Earth's moon. 3200 miles in diameter. Image by Cassini-Huygens/NASA JPL. 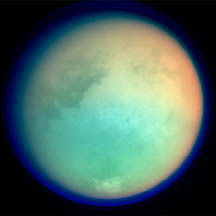 Layers of haze seen in a colorized ultraviolet image of Titan's night-side limb. 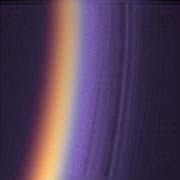 Image by Cassini-Huygens/NASA JPL. January 6, 2007 Pasadena, California - NASA's JPL reports that scientists now have "definitive evidence of the presence of lakes filled with liquid methane" on Saturn's moon Titan. The radar data was published in this week's journal Nature cover story. Radar imaging data from a July 22, 2006, fly-over by the Cassini-Huygens spacecraft provided convincing evidence for large bodies of liquid methane. on Titan today.